DR. LUCKY’s BLUE REVUE is a grown-up variety show featuring comedy, burlesque, variety arts, drag, and dance. DR. LUCKY’S BLUE REVUE is perfect for a girl’s night out, date night, or for anyone seeking an evening of fun loving entertainment. Expect the unexpected and buckle your seat belts for a wild ride! 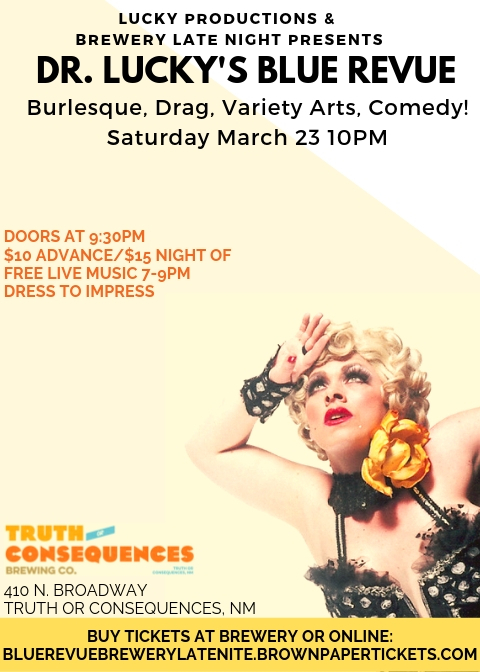 Hosted and curated by DR. LUCKY, Award-Winning Female-Female Impersonator hailed a “Big Bad Bold Drag Queen” by Bust Magazine and a “Burlesque Expert” by NY1 & Big Think (New York City). Featuring Madame Pearl, StrOker Ace, Avery Taureaux, Miss Dee Jones, Nasty Nancy, and Lady Miss Peacock. Production Support from Selena Kareena and Destiny Mitchell. DR. LUCKY’S BLUE REVUE returns to the Historic Hot Springs District of Truth or Consequences in a special “Brewery Late Night” event at Truth or Consequences Brewing Company, where an Imperial Red Ale will be newly available. DR. LUCKY’S BLUE REVUE is a resident show at the Hotel Andaluz in Albuquerque, recently voted the #1 hotel in Albuquerque and #4 in the state of New Mexico. Advanced tickets are strongly recommended, as is staying the night in one of the many Hot Springs hotels within walking distance to the brewery. Thanks to our Truth or Consequences partners who have donated generously to the Blue Revue, including T or C Brewing Co., Latitude 33, Me Gusta World Food, and The Pelican Inn.